Conflict theory suggests that men, as the dominant gender, subordinate women in order to maintain power and privilege in society. Conflict theory asserts that social problems occur when dominant groups mistreat subordinate ones, and thus advocates for a balance of power between genders. Frederich Engels compared the family structure to the relationship between the bourgeoisie and the proletariat, suggesting that women had less power than men in the household because they were dependent on them for wages. Men, like any other group with a power or wealth advantage in Conflict Theory, fought to maintain their control over resources (in this case, political and economic power). Conflict between the two groups caused things like the Women’s Suffrage Movement and was responsible for social change. dominant: Ruling; governing; prevailing; controlling. According to conflict theory, society is defined by a struggle for dominance among social groups that compete for scarce resources. In the context of gender, conflict theory argues that gender is best understood as men attempting to maintain power and privilege to the detriment of women. Therefore, men can be seen as the dominant group and women as the subordinate group. While certain gender roles may have been appropriate in a hunter-gatherer society, conflict theorists argue that the only reason these roles persist is because the dominant group naturally works to maintain their power and status. According to conflict theory, social problems are created when dominant groups exploit or oppress subordinate groups. Therefore, their approach is normative in that it prescribes changes to the power structure, advocating a balance of power between genders. In most cultures, men have historically held most of the world’s resources. Until relatively recently, women in Western cultures could not vote or hold property, making them entirely dependent on men. Men, like any other group with a power or wealth advantage, fought to maintain their control over resources (in this case, political and economic power). Conflict between the two groups caused things like the Women’s Suffrage Movement and was responsible for social change. Friedrich Engels, a German sociologist, studied family structure and gender roles from a Marxist perspective. Engels suggested that the same owner-worker relationship seen in the labor force could also be seen in the household, with women assuming the role of the proletariat. This was due to women’s dependence on men for the attainment of wages. Contemporary conflict theorists suggest that when women become wage earners, they gain power in the family structure and create more democratic arrangements in the home, although they may still carry the majority of the domestic burden. 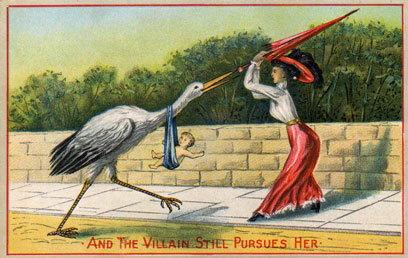 “And the villain still pursues her! “: A satirical postcard from the Victorian era commenting on a society that is structured so that women are bound by convention to fulfill certain roles and obligations.